Okay kids, I really have been thinking of that giveaway. I believe I have settled on the prize, but I need a little more time to come up with an interesting question – something that allows me to learn a little bit about my readers. You can be sure that my questions are out of curiosity and not some bloody marketing strategy. It’s soup season. I was going to say it is soup weather, except it wasn’t when I made this – it was positively balmy and sunny. I wanted to cry my eyes out. Where the *bleep* is my snow?! But today IS soup weather. Overcast, cooler (high in the 50s), rainy… I love it. I have been wanting to try a recipe for seven bean soup for several years. When I walked into the grocery store, I searched the bulk bins for beans. I needed a half cup each of seven types. And then I came across the bin with THIRTEEN beans, all mixed together, right there for me! It was so pretty, I could not resist. In the continuing saga of emptying out my freezer, I found not one, but TWO ham bones! I am always the dork who lurks around at parties that served large hunks of meat, asking if I could have the bone. I have heard that foodie types fight over turkey carcasses or ham bones at holiday parties, but I seem to be surrounded by non-cooks who don’t know that broth comes from bones. two ham bones – yip! While the broth cooked, it gave the house a heady smell – that of baked southern-style ham. You know what I’m talking about – the ham that packs enough sodium to kill a party of 12? Oh yeah, baby, that’s the one. If I sound like someone gushing over her lover, it’s because I grew up in Virginia where Pork is King AND I’m Chinese (pork is also King… or Emperor?). Anyway, I tried out a nifty trick because I was getting impatient waiting for the broth to cool. 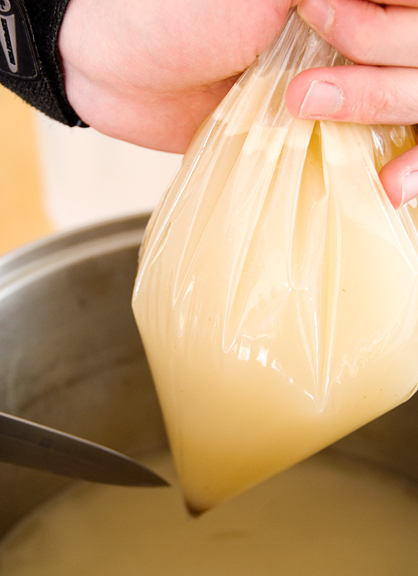 I usually de-fat my broth by letting it cool and refrigerating it so I can remove the fat. But this broth was taking so long to cool off and there was too much fat to ignore, so I de-fatted it with ziploc bags. Worked like a charm! And it also took me back to my sixth grade science fair experiment where I measured the rate of water discharge from a nozzle at the bottom of a bucket and how it varied with volume (height for constant cross-sectional area) of water in the bucket. First Place. SCIENCE!!! The soup is chocked full of delicious beans, vegetables, precious pork meat(s), and that lovely broth. The southern-style ham lends enough sodium to the broth that I never had to add any salt. The ham also gives a little bit of a smokiness to the soup without tasting burnt. Awesome soup. I’m having a bowl of it for dinner right now as I type. Those ham bones work magic too, because the moment I put the bones in the pot, Kaweah came and plunked her little furry self in the middle of the kitchen. I nearly killed myself a few times tripping over her, but she would not be separated from those ham bones… The only thing I would do differently is to dice the sausage rather than slice into discs. I think it works better with the size of the beans and vegetables. 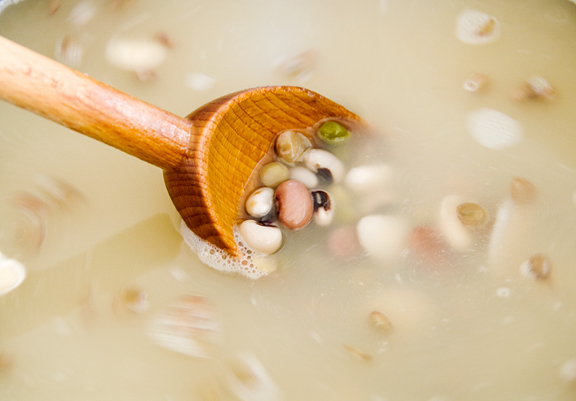 slightly modified from The Complete Book of Soups and Stews by Bernard Clayton, Jr.
Soak the dried beans overnight in a large vessel with enough water to cover 3 inches above the beans. 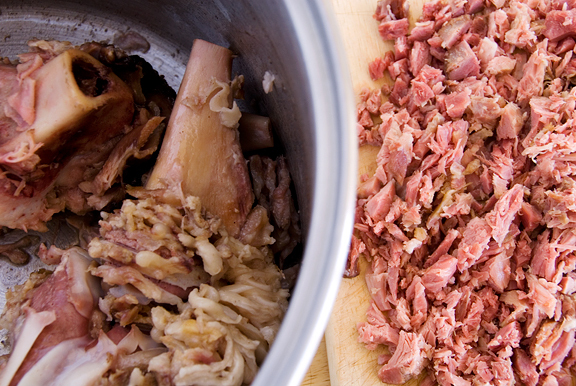 In a large pot, cover ham bones in enough water with 2 inches above the bones (about 10 cups). Bring water to boil and partially cover with lid, reduce heat and simmer over low for 2.5 hours. Skim off brown film as it collects on the surface. Drain the beans. While meat is cooking, place beans in another saucepan and add water to cover plus 2 or 3 inches above beans (about 4 quarts). 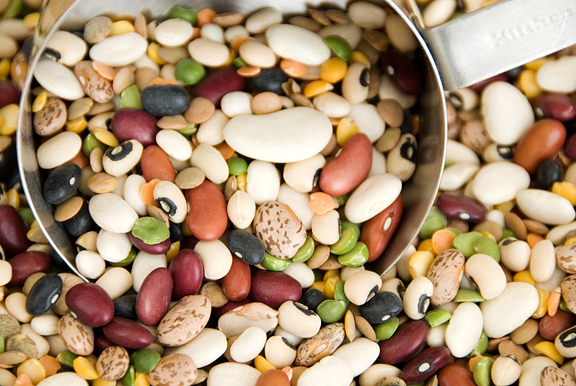 Bring to a boil, reduce heat and simmer for 1 hour or until the beans are al dente – not mushy. Drain the beans and set aside. 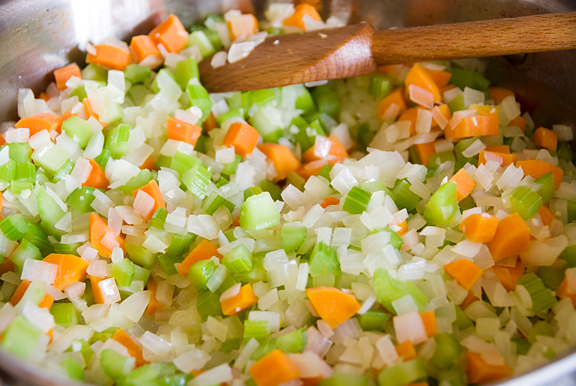 In a large skillet, heat the butter to foaming, add the onions, carrots, celery, and garlic. Sauté until translucent but not browned. Set aside. 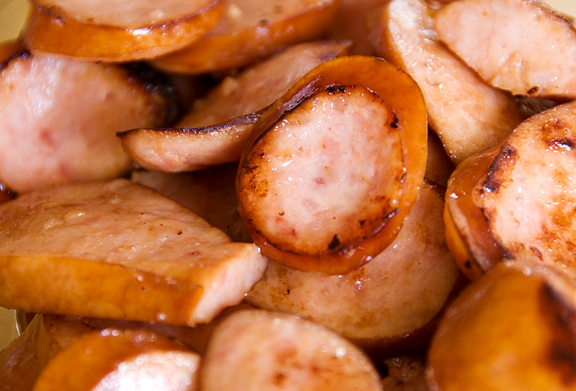 Cut sausage into diagonal 1/4 inch slices and fry in skillet [OR dice, which I prefer]. Cook until fat is released and meat is browned, about 10 minutes. Lift out pieces and discard the fat. When ham bones are done, remove pot from heat and strain the broth into another vessel to cool slightly. Pick off any meat from the ham bones and chop up finely. Discard fat and bones. To de-fat the broth: When broth is no longer hot (but warm is okay), carefully pour half of the contents into a gallon ziploc bag (set it in a bowl or tall tupperware for support). 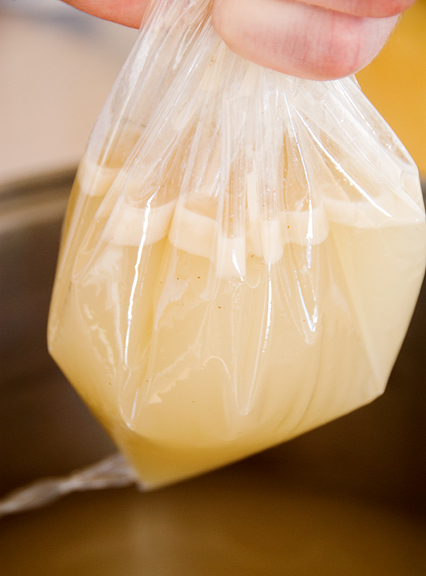 Seal the bag and let the fat settle out from the broth to the top. Hold the bag above the liquid, in your intended soup pot with one corner pointing straight down. Take a sharp knife and puncture the bag as close to the tip as possible. Let the broth release into the pot. When the fat layer nears the cut in the bag, pinch it closed with the other hand and discard. Repeat with second bag. 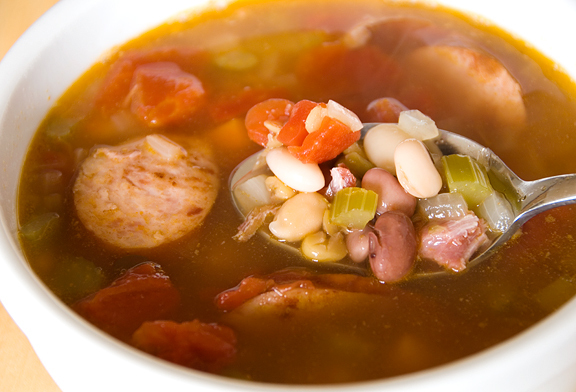 Add the chopped ham meat, cooked beans, vegetables (including tomatoes), and the sausage slices to the broth. 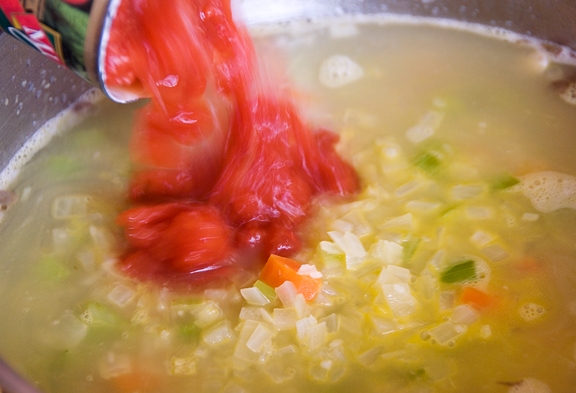 Simmer the soup over medium-low heat for 30-45 minutes. Taste for seasoning. Serve hot. I have never heard of a cranberry bean, but I’m from the south. All we have down here is pork ‘n’ beans. :) This looks so good. You’re inspiring me and one of these days, I might actually just cook in my kitchen instead of using it as a mail sorting center. That tip for de-fatting the broth is worth $. :) So is that pot of soup; looks yummy, Jen, and definitely sets the stage for cooler temps. I’ve got to quit reading your blog late in the evening. I gain weight through the ‘Smell-O-Vision’ application. It’s dangerous, I tell ya, DANGEROUS! This cuppa cocoa ain’t cuttin the mustard for me tonight. I’ve never made broth before but I’ll keep your SCIENCE!! experiment in mind when I have to defat at a moment’s notice. Thazz so clevah! Mmmm…looks delicious! I love soups like this. Perfect for a cold, winter day. Those beans look beautiful and ever so colorful! Your soup must taste really good! Yummy! 13 beans! All these beans and the vege adds such brilliant colours to the soup! I’m never good at dicing, I don’t have such patience! Amazing, amazing, amazing! The photos, the recipe, everything. My husband would love this. Thanks for sharing! Looks fantastic! Though it is a balmy 27’C here in Perth with approaching thunderstorms, so I think I’m going to have ice cream instead! But I’ve bookmarked it for next winter! Thanks for sharing the recipe! Today, in Ithaca, it is rainy, going to be a high of 45 degrees. In other words, *perfect* soup weather! Jen, I love coming here and learning something new from you (the broth thing – I had no idea!). Those beans look so beautiful, I can understand why you could no resist buying them – they looked like a rainbow! I will try this trick to de-fat the broth – a bit afraid that with my amazing skills I will make a mess moving the bag away, spilling broth and fat all over the place. OOO, I always send word around during the holidays that I’ll take ham bones from anyone I know. I always make 13 bean soup, I like mine with lots of sage. I can’t wait for that holiday ham! I love that bean photo. You should frame it and hang it in your kitchen…. just gorgeous. The soup looks yum-master too. love this! must have soup when weather gets cold. it’s hard to find meaty ham bones; i normally use smoked ham hocks and throw in some chopped deli hams or other flavored smoked meat. i think they also come with 16 beans soup instead of 13! That’s a lot of beans. I never thought to put sausage in it, my dad would love that. That is who I make ham and bean soup for usually, my dad. So do you just pinch off the bag when you get to the fat? I hate to wait for it, but isn’t the bag crazy-hot? Love pig. That sentence should imply the subject, as in “I love pig.” I’m not accusing you of being a love pig. Whatever that is. What I mean is: pig tastes good. Awesome trick on separating the fat – I can never skim it off and don’t have one of those fancy separator measuring cups! This is a trick I shall use. I love bean soup and like you am rejoicing in soup weather! That is one lovely soup. Good point about dicing the sausage. I would put in some watercress and maybe macaroni. Why am I so amazed by those beans all mixed together? They look so crazy! Great Soup; anything with sausage usually does it for me. No innuendos. My husband reads Chemistry books for pleasure. I read cookbooks. He gets excited about science. I get excited about kitchen science! I love beans. Healthy, economical, and yummy! Oh. I should really read the whole recipe before I comment. Ignore my question, please. That soup looks good and sounds really tasty. I like making soups with ham bones as the add so much flavour. This soup even has some sausage for even more flavour. GSG – I know zippo about beans, myself. I just like the names of the different beans, and seeing all of the pretty colors together in one bin… well – I ‘m all over that! Steph – I’m not even a legume lover and the soup rocks :) Make a batch and it will give you the warm fuzzies inside after that two-hour class! Margie – best to read the blog right after dinner. Sort of like grocery shopping AFTER you’ve eaten a meal. Rosa – thanks, it’s great. Amy – I have to agree – they look prettier than candy! Patricia – I learned the broth trick from Fine Cooking. So nifty!! Susy – sage sounds like a nice addition! Rose – actually, ham hocks were called for in the original recipe (maybe I should add that) but I couldn’t find any! 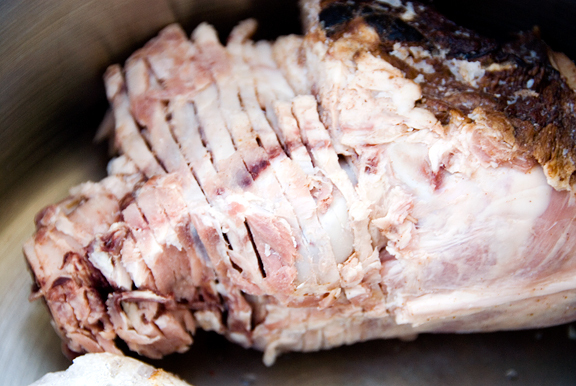 Peabody – two kinds of pork are better than one! Fiona – yup, I just grab the corner and turn it up so no more liquid comes out. hee hee, agreed – pig is AWESOME. ThistleDew Farm – woohoo! soup!! Nate – I think macaroni might make it too heavy for me (it’s already quite filling with all those beans). Graeme – you always make me laugh, hon. Lori – yay for science! I too love kitchen science – it’s like the intersection of two of my topics! Kevin – you’d dig it for sure! Mollie – well, some sixth grader was gonna win the science fair, so it may as well have been me ;) *snort* I have been known to discard a carcass or two in my days… never again! a couple!!! Making this TODAY! Thank you, you wonderful person!!! Yummy!! !